Politics & Immigration On The Plate. You are here: Home / Money / Business / Politics & Immigration On The Plate. 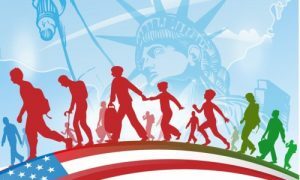 (ThyBlackMan.com) Here are a couple of easy immigration questions — answerable with a simple “yes” or “no” — we might ask any American of any political stripe: Does everyone in the world have a right to live in the U.S.? Do the American people have a right, through their elected representatives, to decide who has the right to immigrate to their country and under what conditions? I believe that most Americans, even today’s open-borders people, would answer “no” to the first question and “yes” to the second. “One: According to a recent study from Yale, there are at least 22 million illegal immigrants living in the United States.